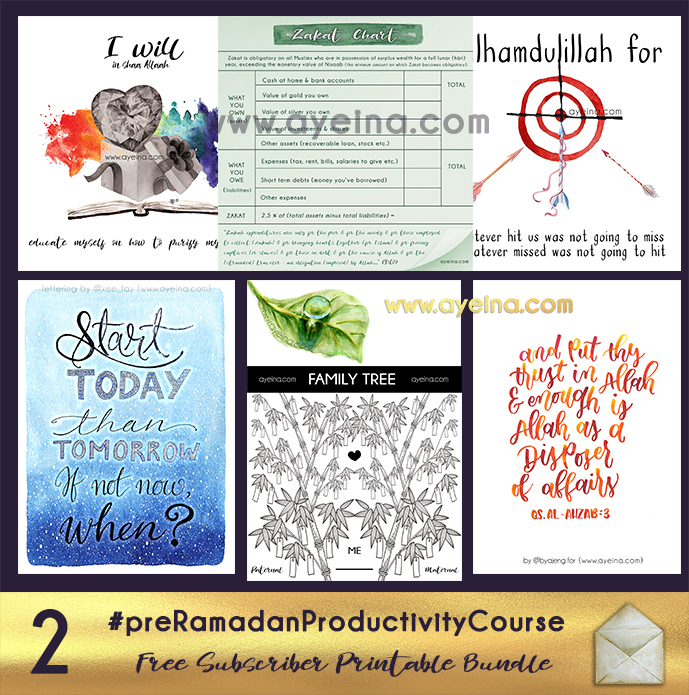 We started this 7 month Pre-Ramadan Productivity Course in the start of October (And if you will be reading this afterwards, this is the second month of #preRamadanProductivityCourse – as a detailed guide on the PRODUCTIVITY JOURNAL FOR MUSLIMS – although you can choose any topic in any month or week, this is simply how we did it and we hope that it helps make things more clear and doable for you in shaa Allah). In November 2017, We picked Charity Chart ((to help us develop the habit of giving and not hoarding – so as to avoid having to declutter again and again as well (as we discussed previous month in the 2nd challenge), Stress Manangement ((to help us manage the stressors in our lives by tracking our moods for better self awareness of our triggers), Maintaining Kinship Ties (to improve relationships beyond our very closed loved ones – to build a community within our blood ties) and Facing Fears (to take risks by putting trust in Allah and achieve the dreams we’ve been praying dua-e-istikhara for). 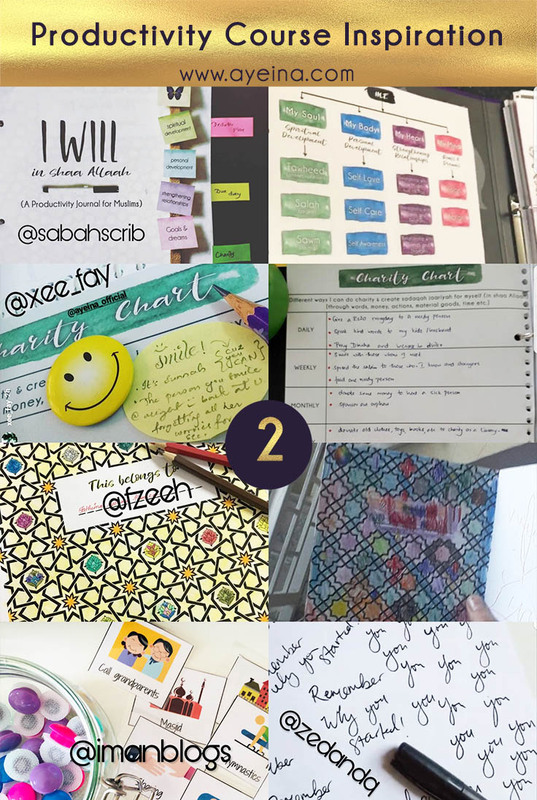 Challenge 1 from *Spiritual Development* was “Charity Chart” in #preRamadanProductivityCourse – Our task this month was to make a list of things we LOVED! And then see what and how we can give it in the way of Allah! 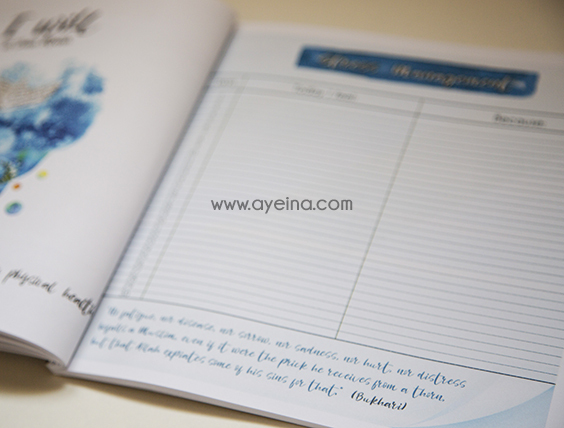 We simply made a chart with division of daily, weekly, monthly and yearly goals of sadaqah. DAILY goals could have intangible things like smiling, a good word, tasbeeh/tahleel/tahmeed etc. – all of which is sadaqah. WEEKLY goals could include volunteering somewhere or giving da’wah etc. 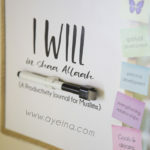 MONTHLY goals could include financial sadaqah, planting a tree etc. – considering it as a seed that will grow and bring its fruits back to you! In shaa Allah. while your YEARLY goals could revolve around zakat! 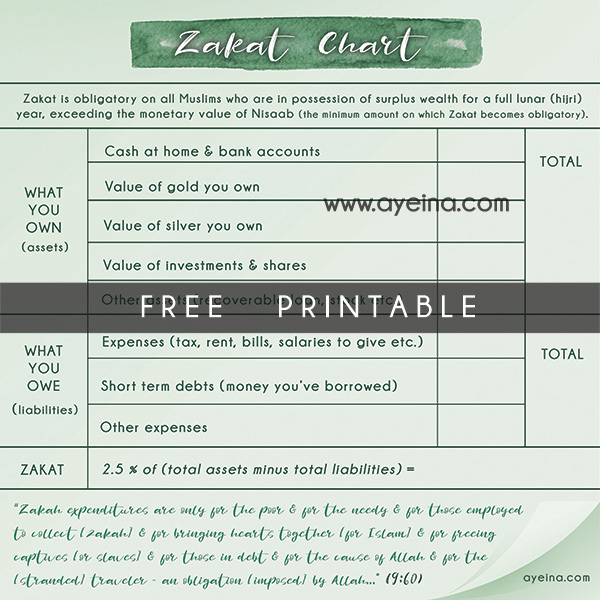 For which we are offering a free extended printable for the journal so you can educate yourself about Zakat in shaa Allah and perhaps teach your kids this important pillar of Islam as well. Educating yourself of zakat is a crucial part of Islam as it’s one of the basic pillars that hold our deen upright. So here are some of the resources through which you can educate yourself of the matter in shaa Allah (may be some day we will do a detailed post on it in shaa Allah). 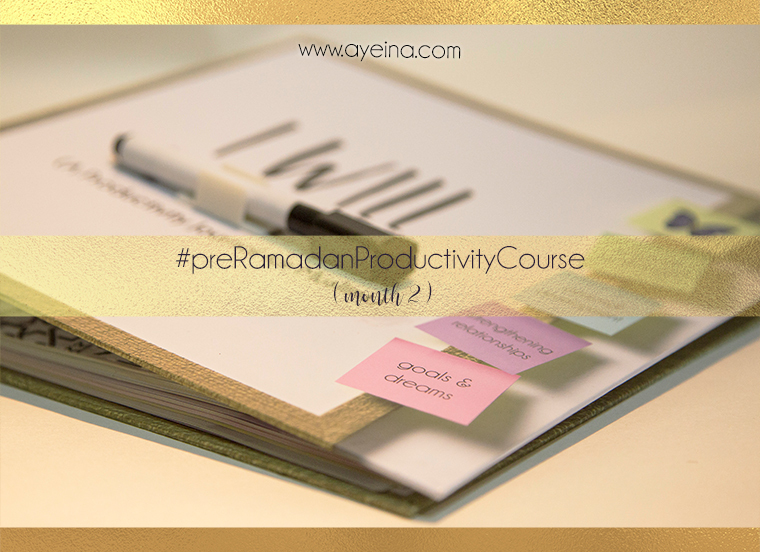 Challenge 2 from *Personal Development* was “Stress Management” (through tracking your moods) in #preRamadanProductivityCourse – to start tracking our triggers & our whys! This exercise was scary because knowing your emotions at a much deeper level and seeing the ebbs and flows of it all can get intimidating…but ‘I don’t know’ as an answer to how we are feeling – is dangerous to our level of personal awareness and mental health. Knowing the cause was certainly half of the solution! (but in this discussion, we saw a lot of people mixing up stress and depressions together) – Please note that stress and depression are 2 different things. Stress isn’t an illness or a disorder, but it can develop into one if it is left to become chronic. May Allah help us maintain our mental, spiritual and physical health. Because all of them are important for our productivity and well being. I know this can be a really hard topic for some people as some people suffer through very hurtful relationships – and they don’t even have the option to cut them off from their life! People have many reasons to not keep in touch with their family members or relatives: busy lifestyle, grudges, toxic relationships, not knowing the importance of kith & kin etc. – the age of social media, we’ve grown farther away from our own blood replacing them with online friends and followers. Of course, that’s easier and probably less hurtful for most but remember this whenever it hurts! 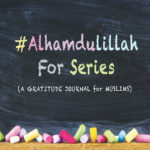 For some reason, Mus’ab bin Umair’s story kept circling around my head since we started the challenge of Maintaining Kinship Ties (especially after so many people talked about how painful their relationships were with their very close family members – mother, father, children, siblings etc.) – although story of Ibrahim (A.S.) & Yusuf (A.S.) are very relatable in this scenario as well. *Mus’ab Bin Umair (R.A.) – his mother took away everything from him when he became Muslim and he went from an elite young boy to a boy who didn’t even have a cloth for his own funeral. *Ibrahim (A.S.) – his father was one of the people who threw him into the fire because of his acceptance of Islam and yet he prayed for him and requested Allah to not disgrace him on the day of judgement by throwing his father into fire. *Yusuf (A.S.) – his brothers threw him into the well out of jealousy and he lived most of his life as a slave (without a family), spent his youth in the prison and yet forgave them when he became a king. So yes, even though you may have an extremely difficult relationship with your parents or children or siblings etc. Let it not stop you in your path of righteousness. Let it not affect you in a way that you give up on everything khair in life (refer to the 2nd challenge *stress management*). Do not become hopeless of the mercy of Allah that you lose sight of aakhirah. Challenge 4 from *Goals and Dreams* category was “Facing Fears” in #preRamadanProductivityCourse – The task was to trust Allah and TAKE AT LEAST ONE RISK you’ve been wanting to take all along! The reason why we did the challenge of “dua diary” last month (defining your goals and doing istikhara for them) was to face THIS challenge this month! The challenge of finally putting your vision into action! The challenge of finally DOING IT! (For those who have the Productivity Journal, this detailed exercise is on page 81 & for those who don’t have the journal, we don’t mind you copying this in your own diary if you prefer it that way! Although buying the journal will save you much time and organisation in shaa Allah 💞). Taking risks doesn’t always mean taking a step forward, it sometimes also mean taking a step back – when you’re not supposed to (according to the world). Sometimes it means to stop and watch others go forward because you have different values, different priorities…When you step back at times, that’s also called “Facing your fears”. 5 – a hand lettered quote (by @xee_fay) – Start Today than Tomorrow – If not now, When? My step this month is to set up a women’s only fitness fundraising event in January. I’m super excited about the possibility of raising money for charity but there’s a lot of worries and fear about not being able to reach my targets. But in this case I’ll take the advice and trust Allah! YAAAASSSS you go girl! you can do thissss! in shaa Allah! and remember, even if you don’t reach your target, you will go with a huge amount of experience and learning! There’s no downside to trying! Unfortunately these days with kinship…family can actually be your worst enemies and it can be hard to keep ties with them. Even if you try it gets thrown back in your face. We are having some issues at the moment and frankly life is better without those particular ‘family’ in our lives. But it is hard as Islam does say to maintain ties. – on how to deal with toxic relatives? Sharing the excerpt: Although it’s best to go as far as you can go in terms of kindness but if toxic family members are harming your mental, emotional and spiritual health constantly, you can maintain distance and limit contact. If you think that being constantly in touch with them is going to push both of you at the edge of cutting ties altogether, it’s best to visit/call once in a while only. 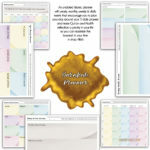 I love what you ladies do, and I love printables you ladies have included. This is such a lovely post! I need all of it! I feel like every Ramadan I am cramming for an exam, when really I should have a plan 🙂 Jazak’Allah khair for the tips, and I hope to go along on this productivity journey with you.